Italian novelist; born at Lugo, Romagna, Sept. 21, 1826. Persecuted by the Austrian government for having taken part in the revolution of 1848, he left his home in Finale in 1849 and went with his family to Toscana. He completed the study of law at Pisa (1852), but on account of his father's death studied journalism in order to support his widowed mother and his brothers and sisters. In 1859 he was received into the Ministry of Education, was afterward made director of museums and art galleries in Florence, and finally became chief of the department. He was also created a knight of the Cross of Merit of Savoy. Besides contributing to the "Spettatore," "Indicatore Letterario," "Nuova Antologia," and "L'Eco d' Europea," Donati wrote a collection of novels, "Foglie Secche," 2d ed., Florence, 1884; "Rivoluzione in Miniatura," his best work (1876); "Bozzetti Romani," Rome, 1884; "Storie Bizzarre," 1888. 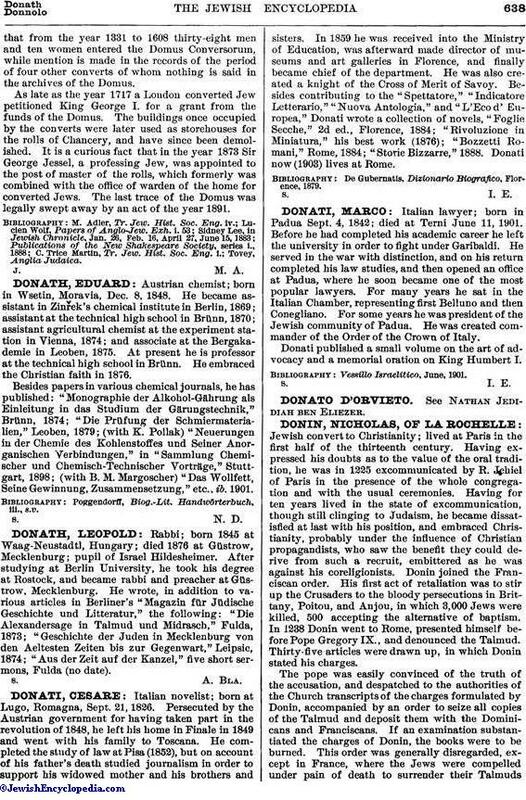 Donati now (1903) lives at Rome. De Gubernatis, Dizionario Biografico, Florence, 1879.